The Hollensbury Spite House in Alexandria, Virginia. We've all gone through insane lengths to spite someone before, haven't we? And spite is a confusing feeling, mixed with pride, justice, power and… guilt. But don't feel too guilty. At least you didn't build an entire house to spite someone like these people did. Mental Floss is highlighting nine houses that were built just to screw someone over by thwarting city planners or challenging city ordinances. Whether it's due to an odd shape, being built on a microscopic lot, or a mind-blowingly odd renovation, these homes are full of character--spiteful character. 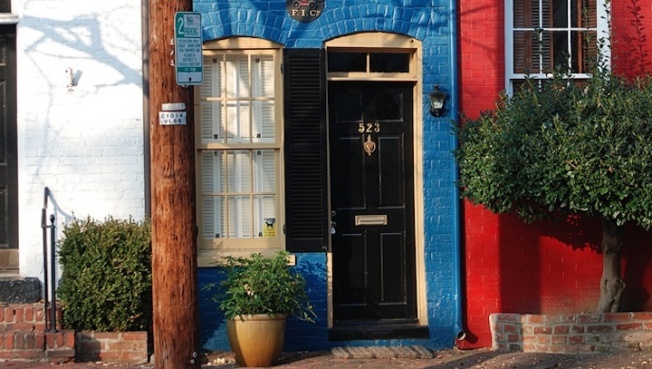 For example, the Hollensbury Spite House in Alexandria, Virginia, looks adorable from the outside. It's a sliver of a home painted in poppy, bright blue. But the seven-foot-wide home wasn't meant to be adorable, it was built by one of the next-door owners so nobody would loiter in his alley. It seems like a lot of trouble, but yet it's also incredibly effective. The Skinny House in Boston is the result of an inheritance dispute between brothers. One brother built a large home on the land he shared with his brother, who was in the military. When his brother returned, he was so mad he built the skinny house so as to block the sunlight from the larger home. The four-story house is wider in the front than the back. Read the rest of the stories at Mental Floss.